In a career spanning more than thirty years, Larsen’s intuitive paintings, watercolors and drawings establish an energetic dialogue about perception and the transitory moments of life. Working primarily in monochrome silhouettes, she employs alternating scales to reconstruct the subjective realities of her narratives. Instead she proposes an inductive perspective, abstracting people and things from her daily encounters that reflect the circumstances of Larsen’s practice. Her paintings dissolve the boundaries between figuration and abstraction, with objects transforming fluidly into organic geometric forms. She paints with densely applied egg tempera to create the illusion of volume to allow isolated elements to become vivid archetypal forms and graphic signs. Throughout her recent works, urban space and the ways in which people engage with it have been a primary concern. Drawing inspiration from the fleeting moments of everyday life, figures are devoid of context, either standing alone or with blocks of color. 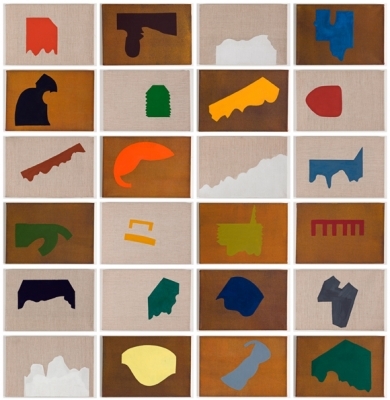 In Big Men (2011), heavily bundled men isolated against the canvas appear to be engaged in a ritualistic dance, alternately moving closer and further away. Likewise in Berlin Blue Abstract Walking (2010), an unknown woman, identifiable only by her profile, poses in each canvas. Reduced to strictly physical cues, each stance ranges from contemplative to interrogative. This series takes its title from a specific blue that was discovered by eighteenth-century alchemists working in the Prussian capital. From anonymous figures to pared-down industrial environments, she seeks to integrate the identifying characteristics of her location with her works. Larsen approaches the subway as a linear system reminiscent of Mondrian’s urban grids while in Scrap Metal and Scrap Metal Heap (2011) Larsen records the scrap metal heaps that were immediately outside of the window of her Brooklyn studio. Reduced to abstract swathes of bright yellow, blue, orange, and green, the utility of each jagged piece dissolves into an amoeboid shape. In Smith Street (2011), the blurred relationship between figure and ground disorients perspective. Although Larsen makes reference to a specific location, her paintings examine the fundamental relationships between people and their surroundings, preserving initial observations and glimpses to allow for prolonged reflection. Liv Mette Larsen was born in Oslo, Norway in 1952 and attended the Oslo SHKS School of Art and Crafts. From 1978-84 she studied at the Berlin Hochschule für Künste (UDK). In 1992 she won Berlin’s Senate Cultural Affairs Department Grant and Norway’s Vederlagsfondet Grant in 1994, 1996, 1997 and 2006. She received additional grants from the Norwegian Cultural Council in 2000, 2004 and 2006. Recent solo exhibitions include Literaturhaus, Salzburg, Austria (2006), Galerie Kai Hilgemann, Berlin, Germany (2007, 2008, 2010, 2011, 2012), Galeria Fruela, Madrid, Spain (2008) and Helac Fine Art, New York, USA (2011). She has exhibited internationally for over three decades and her work is included in major public and private collections, lately the Caldic Collection in Wassenaar, Netherlands.